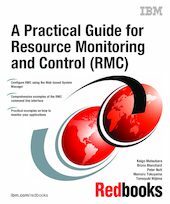 This IBM Redbooks publication discusses the capabilities of Resource Monitoring and Control (RMC) that enables you to monitor various resources of your system and create automated responses to changing conditions of those resources. RMC is provided by the AIX 5L Version 5.1 and later operating systems and is a subset of the functionality available in Reliable Scalable Cluster Technology (RSCT). RSCT provides a set of software components that together support a powerful and flexible environment for clustering systems. exploit RMC to manage IBM eServer pSeries servers running AIX 5L Version 5.1.